A police officer in northern India was killed in the area. Cows, considered by Hindus as holy, had been slaughtered in the area. BBC Hindi's Nitin Srivastava reports from Bulandshahr to the state of Uttar Pradesh, where the incident happened. 0:00 local time (04:30 GMT) on Monday when Inspector Subodh Kumar Singh sat in his official vehicle and asked the driver to make the SUV "fly". The driver, Ram Asrey, drove as fast as he could. 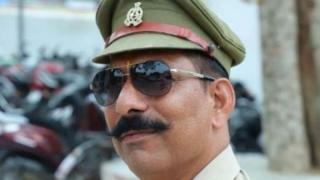 Mr Singh, 47, in charge of police station in Siyana, a village in Bulandshahr. He had received a call that morning Asked to go to another police station, Chigrawati, about 5km (3 miles) away, where an angry mob of villagers had gathered. They have been found to be carcasses of cows earlier that day in the fields – videos, which started circulating on WhatsApp and social media, show a tractor with several carcasses blocking the road leading to the police station. Cows, which are believed to be India's majority Hindu population, have become a flashpoint in India in recent years. Many states, including Uttar Pradesh, have started enforcing bans on cow slaughter since the Hindu nationalist Bharatiya Janata's party came to power in 2014. So-called cow vigilantism has been killed in the past few years. But an attack on police is unheard of. An 18-year-old protester, that is, killed in the violence. Inspector Singh's killing and are looking for 23 others. The mob in Chigrawati, according to eyewitnesses and police officers, has grown to include more than 300 people as those from nearby villages so joined in. They were demanding the immediate action to find out who is responsible for the alleged slaughter of cows. And the six officers inside the police station had started frantically calling the district headquarters. It's unclear if they are called Mr Singh directly or if it is ordered to go there as part of reinforcements. When Mr Singh arrived, he approached the mob, hoping to pacify them. Eyewitnesses told the BBC that, unlike some of the other policemen, Mr Singh was not wearing a bulletproof jacket and did not have his pistol in his hand. The thousands of Muslims were gathered in the Bulandshahr for a religious event. So officials feared the mob's anger could spiral and lead to religious rioting. But, eyewitnesses say, the villagers only got angrier and more aggressive even more police officers began to arrive. It's unclear when the violence broke out but one eyewitness, a man working in a school near the police station, told the BBC that he could hear the two sides fighting for more than a half hour and gunshots wrestled out at regular intervals , He says he's locked himself in the school's bathroom. Police said they were armed with homemade revolvers and opened fire first. But eyewitnesses, some of whom were watching from the other side of the road, said the violence broke out only after being shot in the air and trying to disperse the crowd. The mob also sets fire to the police station and several vehicles parked outside. As the officers scurried for cover, the men started to hurl stones and even bricks at them, Mr Asrey said in an interview on Monday. Some officers managed to flee inside the police station, but Mr Asrey and another officer ran to the SUV to escape. "That's when I realized Mr Singh had been hit by a brick and was lying unconscious," he says. So, he put him in the car, got into the driver's seat and started driving away from the mob, which was off the road, and towards fields. Mr Asrey says the mob follows them and tried to attack the vehicle. "The wheels of the vehicle were stuck." We had no choice but to get out and run. " Mr Asrey was injured but survived. He does not know how Mr. Singh died. But a video, which has gone viral since Monday afternoon, shows Mr Singh slumped out of the SUV and motionless. Men could be heard in the video asking whether he was dead or alive while gunshots were going off in the background. The Inspector, who is living in Noida near Delhi, was declared dead when he was brought to the hospital. The post-mortem report says that he is a bullet wound above his left eyebrow. A police officer told the BBC that Mr. Singh's three mobile phones and pistol were missing.